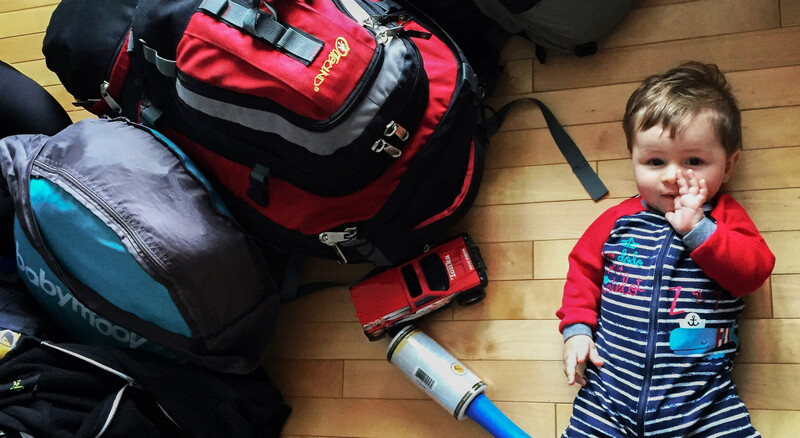 There are a lot of questions that come when travelling with a baby. Before leaving for this trip, I tried to read as much as possible on the subject because I did not have many families who had made big travel around me. And when I came back from my trip, I sort of became a reference, for other moms I knew that were planning on leaving on a long trip. They all wanted to know more about travelling with a baby. 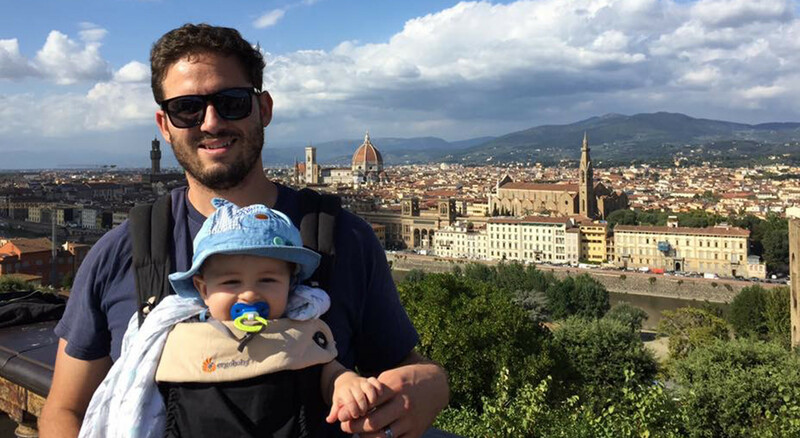 I want to share with you my tips and tricks to help you with your upcoming trip with a baby. Basically, we left for a month to Italy with Téo when he was about 6 months old. We visited over 8 destinations during that trip. Here is how we did it! We tried to be strategic when booking our flights to Italy; unfortunately, most flights leaving out of Montréal have a layover somewhere along the way. While booking our flight, we also made sure to book a cradle for the baby. You know the one that hooks on the wall, where the baby can sleep all flight long (costs $$$). On the way to Italy, we flew overnight. Luckily, a seat was available in-between the two of us, giving us more space for the baby. Thinking we were also going to have the cradle, we thought this was going to be the best flight of our lives! But no, for some reasons we were refused to use the cradle, Téo was supposedly too old for it. Anyways, as I was saying, we only had the chance to try the cradle on the way back home. We found it very useful, mostly since our flight was 8h long. Be aware there is a certain age and weight requirement. Also, it must be reserved at the same time as when you book the flights, because the cradle can only be used in certain areas of the plane. 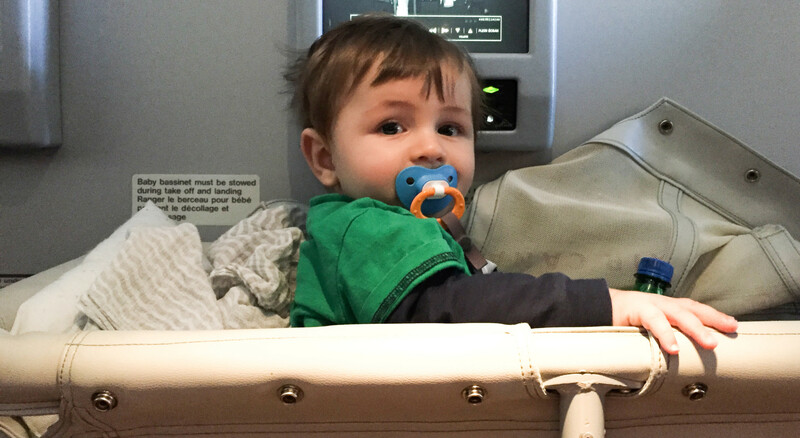 We brought a couple things on the plane to make our flight more enjoyable such as a soother, his favorite blanket and the baby carrier. The baby carrier, turned out to be very useful when the baby wants to be close to you but you need your hands free. It helped us to put the baby to sleep on the plane, but also everywhere along the trip. On top of that, we brought single wrapped snacks; which are easy to carry and easy to open, a couple of Téo’s favorite and quiet toys, a jug of water, everything you need to breastfeed or feed, as well as an extra set of clothes. Finally, we brought all weather clothes and diapers for 2 days of changes. People often ask me if Téo was too young to go on a month-long trip. I personally think that wherever your baby will be, if they have their parents love, a clean diaper and a full belly, they will be happy. Keeping that in mind, your baby can follow you anywhere in the world ;). Being prepared, is key, reading about the weather, being aware of what you are getting into with the transportation, accommodation, etc. ; will help you have a more enjoyable trip. The place you will be visiting will help you plan for what you need to prepare for you and your little family to feel comfortable. You also must keep in mind that babies are everywhere in the world, so you will always be able to buy something if you need it! The time difference to Italy is plus 6 hours (compared with Quebec). Due to jet lag, our baby took 3 nights to get back to his normal routine. The couple first nights were a little bit rougher than expected, this is something you must keep in mind. The longer your trip will be, the more enjoyable, it’s going to be for you. Simply because the ratio of bad nights will be separated by more good nights than if you leave for a short period. Almost every day, we were leaving with the stroller. In the stroller’s basket, we always had the baby carrier. This gave us more ways and opportunities to carry our baby. We also had a thin blanket that we used for the beach to allow the baby to stretch out, to use for picnics, to protect him from the weather, or even to put him to sleep. We were also carrying a backpack in which we had many snacks, a lunch, toys, diapers, sunscreen, water and everything else we would need for the day. With everything I read, and based on my experience I can tell you that less is more. Which means you should focus on doing a big activity a day or two small activities a day (one in the morning and one in the afternoon). Travelling with a baby takes more time. To be able to enjoy your trip to the fullest, you need to give yourself more time than you normally would. I recommend, if you visit different cities, to plan 3 to 4 days for each city. Simply to allow everybody to have time to settle down before leaving for your next destination. 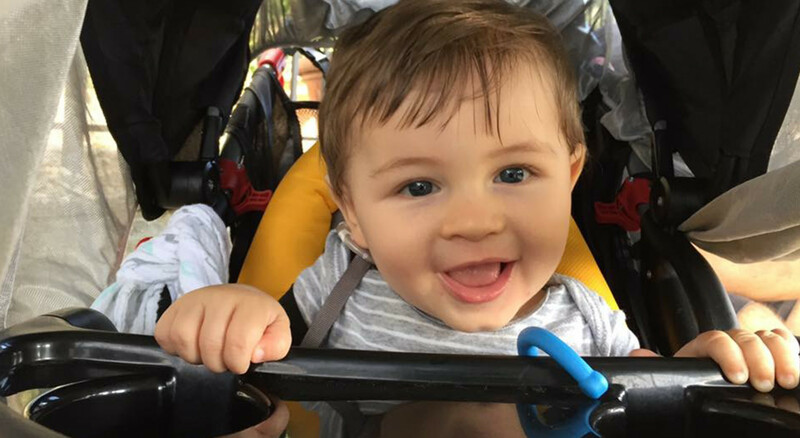 This approach gives you time to see and visit everything you have wished for because travelling with a baby requires more stops and more time. Here is an example of why you should book 3-4 nights per destination. We booked two nights at La Spezia (Cinque Terre). We were leaving from Venice and we were going for two nights at La Spezia and after which we were headed to Florence. So, let’s say as you’re reading these lines, you’re in Venice and it’s 2pm. Around 5pm you will be going back to your hotel in Venice to get your luggage ready. This way you will be able to leave bright and early the next day. Keep in mind that you also have to make dinner, give the baby a bath, and get ready for bed. The next morning, you get up at 6h30 am, in Venice. You make breakfast for everybody and pack up the last couple things. At 9h15 you are at the train station, waiting for your train that will be leaving in half an hour for La Spezia. You arrive at la Spezia at 13h45, a little lost, in a city you have never been to, before. You take a couple minutes to figure out where to go, then you take a couple buses and walk a bunch. Finally, at 3pm, you arrive at your hotel to drop off your bags, but also to quickly unpack them as you are very excited to start exploring this new city. You unpack just enough, so you have everything on hand to prepare the baby for bed, because you know you will probably get back to the hotel late that night. So, let’s be honest here, you are still not on vacation mode as you’re always thinking about “what’s next?”. Also, you haven’t been on vacation mode since last night at 5pm. Once everything will be ready to go for the baby, probably around 5pm tonight, you will be able to go back to your chill vacation mode. But, you probably forgot a small detail, you’re only staying at La Spezia for two nights. So tonight, will be your first night… and tomorrow at 5pm you will probably have to go back to preparation mode to get ready for your next destination. I highly recommend taking 3 to 4 night stay (minimum) for each city. This way you will feel like you had a vacation. Most of all, enjoy those beautiful discoveries and those precious moments with your family discovering the world. And you, how was travelling with a baby? excellent!! I loved it so much, Thanks for sharing this content.